Let LaCi make your next event the talk of the town! 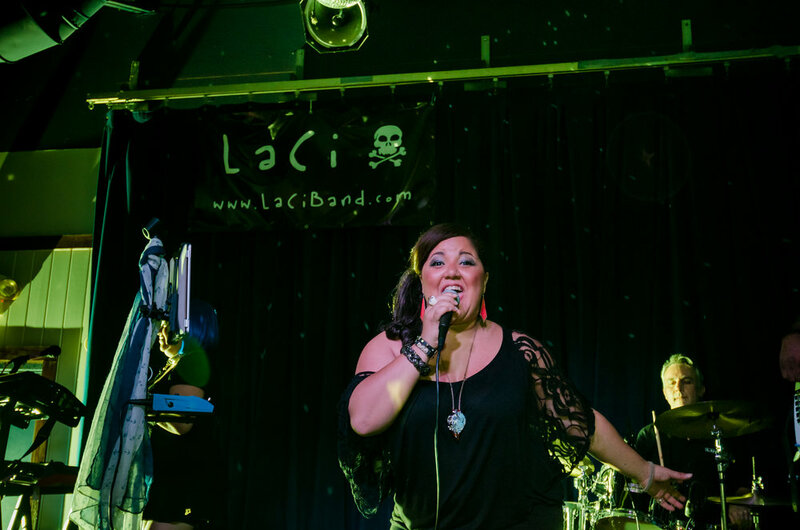 Based in Wilmington, North Carolina and comprised of some of the Port City’s most versatile musicians, the members of LaCi have played together in one configuration or another for many years. LaRaisha Dionne and Chiaki Ito founded LaCi in summer of 2014. The band has been seen in many diverse settings, from backing rock-musicals at City Stage, Thalian Hall, and Raleigh’s Memorial Auditorium and Theatre in the Park to opening for R&B legend O’Bryan at Greenfield Lake Amphitheatre, to playing for packed crowds at Wilmington Downtown, Carolina Beach Boardwalk and the Azalea Festival. 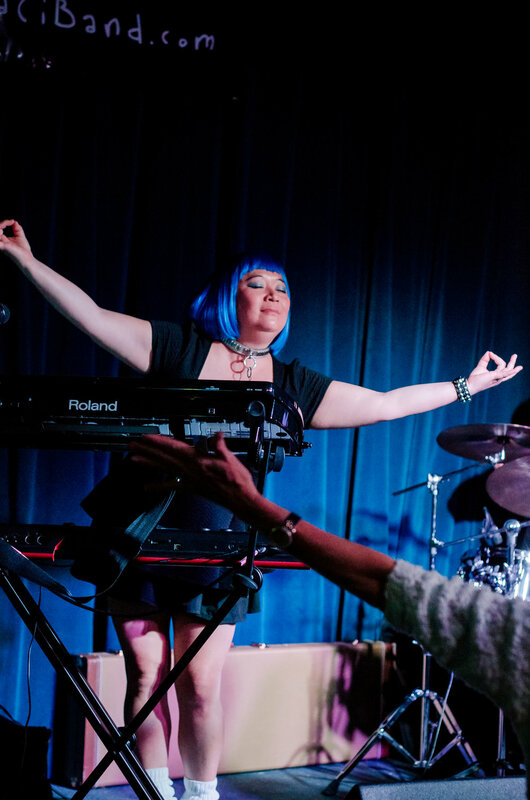 LaRaisha and Chiaki have played numerous duo events creating great mood music for audiences at Cameron Art Museum, Dram and Morsel, Anne Bonnie's, and The Dubliner. We have played for private weddings, gala events, and fundraisers for various churches, schools, and non-profit organizations. 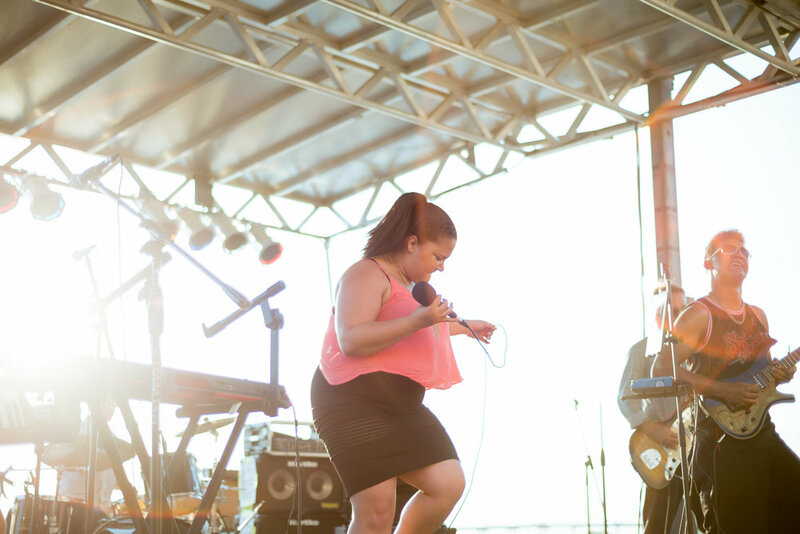 We cover many genres, including rock, jazz, blues, pop, and reggae. Music is our passion and we are excited to share our love of music with you! We would love to play for your wedding, engagement party, corporate event, holiday party, fundraiser, public event, birthday party, anniversary party, graduation party, wine tasting, or festival, just to name a few! Contact us and we will work with you to create the atmosphere you want for your event! LaRaisha Dionne (vocals) LaRaisha is an actress, performer, and songwriter. Her passionate and sincere lyrics seem to burst through each note and chord. Her style is unique with a collection of soulful melodies, upbeat rock rap anthems, and funky pop tunes. Her voice, much like her name is one you won’t soon forget, garnering the attention of the industry in varying mediums: including two Best Actress awards for her portrayal of Billie Holiday in Lady Day at Emerson's Bar and Grill, a cameo as The Jazz Singer in full length feature film The Sin Seer starring Isaiah Washington, a national Nickelodeon tour, a performance for Jackie Chan at the Mandarin Oriental in Singapore. Music runs in the family; from her father, O’Bryan, a recording artist with four billboard charting albums while signed to Capitol Records, to her brother, Brandyn Burnette, an up-and-coming recording artist signed with SONY ATV publishing and being pursued by many of the industry's top record labels and publishing companies. She resides in Wilmington, North Carolina where she manages sold out events for a 1500 seat performing arts venue while writing and performing with LaCi. Chiaki Ito (keys, ukelele, beats) Chiaki is a graduate of NC School of the Arts, UNC-CH, Univ. of Guam and Univ. of SC. She has music directed over 80 musicals in the Wilmington area and produced over 30 shows for City Stage. In 2010, she was recognized by Raleigh’s Indy Week Magazine for Best Music Direction for The Rocky Horror Show. She has also been recognized by the Star News Theatre Awards for best music direction of City Stage’s productions of Chicago (2011) and The Rocky Horror Show (2014). She has been seen on the cover of Wilma Magazine (July 2011) and has been featured in Salt Magazine (April 2014). Chiaki has been practicing law in New Hanover County for the past 20 years. Since a child, Christopher Marcellus has always been attracted to the magical allure of music and to this day, that attraction has afforded him the opportunity to have performed on stages versatile enough to include holding down the low end for legends like Tom Browne (“Jamaica Funk”) to night after night performances (on bass) of the Tony Award Winning Musical “MEMPHIS.” Not only is Christopher Marcellus an avid bassist, but his passion also lies in music production with a skill set spanning the gambit of writing, vocal arrangements, musical production and even recording/mixing/mastering engineer. Christopher’s production prowess has landed him a STELLAR AWARD as well as a CAROLINA MUSIC Award for best Album and Best R&B single (female). Being a multi-instrumentalist (drums, bass, keys and a smidgeon of guitar) is only indicative of his musical curiosity, which keeps him striving for a more vast yet palatable approach to music and all of its beautiful colors through an array of genres. Understanding that music is more than a universal language, that it’s a pathway to a plethora of fulfilment across all ages, creeds and cultural boundaries, is what allows Christopher Marcellus to fit into so many musical arenas. Christopher became a part of LaCi not for the sole purpose of just “having another band to gig with,” but because he recognized the gifting that each of LaCi’s members held…not Just their musical gifts, but the gifts they hold that include an unconditional love for each other and a relentless tenacity for perfecting the craft of music on a unique level, their gifts to recognize music beyond what it “sounds like” but how powerful of a tool it is to liberate, heal and unite, which when all of the aforementioned are combined, make for a cocktail of irrefutable and hypnotic musical taste that knows no boundaries. Alex Tomlin, a native of Wilmington, NC, discovered his ardor for music at an early age. He was formally introduced to music when he joined the band at Williston Middle School, and remained in musical ensembles throughout his high school and college studies. He's a member of the prestigious Wilmington Symphony Orchestra, and has been since 2008. He's an educator by trade, and enjoys the outdoors and sport related pastimes. Brien is a life-long bassist, whose colleagues respect for his ability to listen, along with his understanding of his role within any musical “team”. He is versed in many genres; traditional and big band jazz; funk, R&B, off-Broadway Musicals and contemporary music from the 50’s through current. This Bass player was born and raised in Connecticut. Beginning his career as a bass player while in High School, his bass studies began classically on Double Bass with Rick Rozie (Principal Bassist – The Hartford Symphony) at the Hartford Conservatory of Music. Following High School, Brien earned a Bachelor of Science degree in Music Education from Western Connecticut State College. At WestConn, Brien’s primary instrument was Double Bass. He studied under Jack Messing while at WestConn. During his Senior year, Brien studied Double Bass privately at Hartt School of Music with the team of Leland Tolo (retired professor of double bass from the Hartt School at the University of Hartford) and Gary Karr ("the world's leading solo bassist" (Time Magazine). From the mid-seventies through the early nineties, Brien was Bass player and vocalist with Coalition, a 7-piece funk band based out of the Hartford area. Following Coalition, Brien worked with the Jarvis Entertainment Agency in the Hartford area playing bass with a versatile quartet, playing anything from jazz classics to top-40. After leaving the Jarvis Agency, Brien became a member of a Torrington, CT-based wedding/party band, SoundDesign. Brien played bass and sang lead vocals in this group for roughly 20 years. Following the disbanding of SoundDesign Brien built a MIDI trio based upon the repertoire of SoundDesign. Brien architected the equipment needed to produce a realistic computer-based sound and did the majority of the MIDI programming of the material performed by the trio. In the early 2000’s, Brien was the bassist for the Bristol Reunion Jazz Band and the Steve Lord Big Band, both of which were 18-piece Swing-style Big Bands. Brien also played Bass with the Jazz Bones, a unique swing-style jazz band comprised of 5 trombones and a rhythm section. Brien also freelanced in small jazz venues on electric bass. Since moving to Wilmington, NC in 2015, Brien has been playing with the Night Harbor Band, a classic rock group. Brien has also been freelancing on Bass, performing area shows with the Rock and Roll hall of fame Drifters and the Platters. Autumn Leaves - Leslie Odom, Jr.